We wanted to look in more detail at the bathroom design process, to show you how we tackle specific issues and work with a brief to create a stunning, functional space. 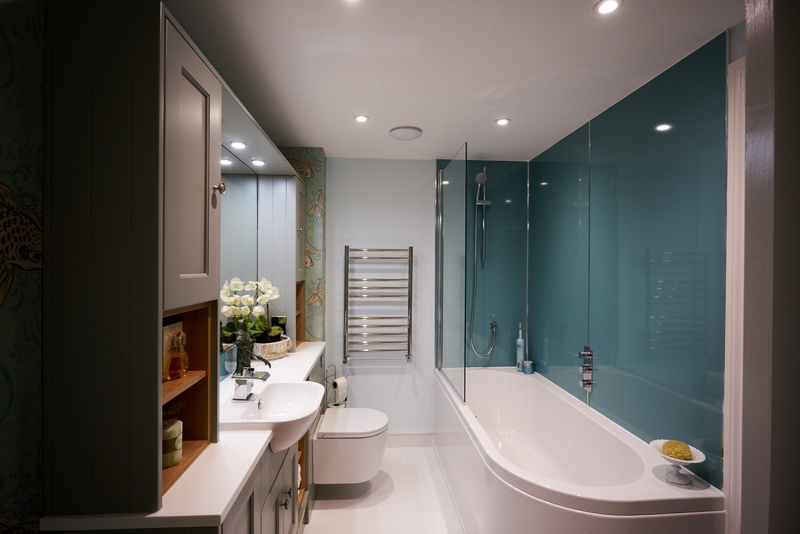 This week we’re looking at a beautiful master en-suite bathroom in Brighton. We will talk you through the project, from brief to finished room, and let you in on some insider bathroom design tips. The original en-suite was dated, cramped and had little storage. Our client wanted to create an inviting, characterful space that was practical as well as beautiful. She wanted a timeless, streamlined design. There were two doors into the room, which our client wanted to keep as she likes the flexibility this offers. Working to this brief our designer Rosie came up with a stunning design for our client. Having visited the house, and taking inspiration from Brighton’s maritime heritage, Rosie created a colour palette based around blues and muted greys. 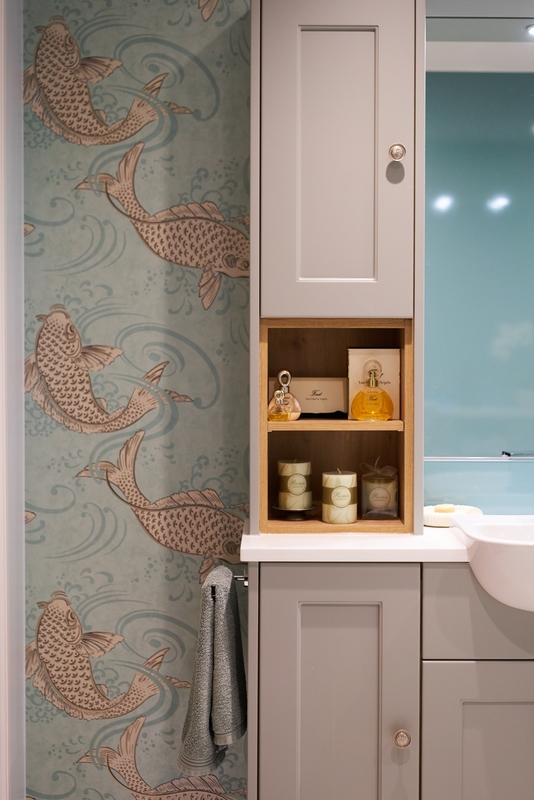 She used bold, patterned wallpaper in a fish design along one wall to continue this aquatic theme in a stylish, fun way. Pops of brighter blue come from the waterproof shower board. This is a great alternative to tiles if you’re on a budget or want a speedy way to refresh your bathroom. They are easy to install and clean, and don’t need any grouting. In this project the shower board helps keep things pared-back and simple, and provides a clean-lined backdrop for the wall opposite. Slimline, unobtrusive storage units in soft grey look classically chic and hide any bathroom clutter. As these are bespoke units they make maximum use of the narrow space. We inserted some recessed shelving on either side of the mirror and under the sink, which we kept in bare wood to add warmth to the overall design. Symmetrical cabinets above the shelves have the same silver door pulls as the bottom cabinets. These inject shine and personality to the storage area. The sink has a sleek, wide single tap and splash back in the same bright blue as the shower board. This creates a lovely continuity with the reflected blue in the mirror above, and helps gives the illusion of more space. The inset lights take up little room whilst illuminating targeted spots. A floating toilet adds to the spacious feel by leaving space underneath and above. To soften the approach on entering the bathroom we used a curved-edge bath. This also creates more space by avoiding unnecessary corners, and creates a natural flow around the room. Our client was delighted with the finished bathroom, saying: ‘I can’t thank TBBC enough for making my dream bathroom become a reality. I am the envy of my friends!’ This is what we love to hear! In fact, this bathroom was such a hit it was featured in this month’s Ideal Home magazine. It is so satisfying to know that we’ve helped make someone’s home even better, and created a space that they can really be proud of. This is the most important aspect of successful bathroom design – giving you a room that you will love for years to come. And it’s nice to be able to show off to your friends, just a little bit, too.